Pakatan Rakyat went a little chaotic when Lim Kit Siang and Lim Guan Eng decided to contest by using PAS' banners for GE13 as CEC election issue is still yet to be decided by ROS. The weird thing is, the issue of using PAS' banners still exist even when ROS has announced that the party is allowed to use their 'rocket' logo while the issue is investigated. This decision was made based on the law where the registration of the party is still not officially deregistered because it is still under investigation. With that, ROS has sent a postponement of investigation letter to DAP on the basis of consideration, after considering the party's hectic schedule to face the coming election. The letter was sent in early April, however, a week after, Karpal Singh made a statement claiming as if they just received the letter. However, DAP deem the letter sent via fax as unofficial and decided to reject it. DAP then gave their ultimatum to ROS to send the official letter before 3pm on the next day, or they will contest by using their allies party banners. It is clear that DAP intentionally refuse to use their own party banner. They know that DAP logo has been described as cruel, corrupt, racist and stupid at calculations. DAP's bad tactics gets obvious when they prefer to use PAS' logo than PKR, even when PKR is a lot 'friendlier' towards the principal and aspiration of their party. This is because DAP is aware that PAS members, generally, are obsessed with the party no matter what the banner or slogan the party hold. Thus, by contesting on PAS' banners, these obsessed supporters would definitely choose DAP candidate thanks to their blindness. However, DAP's tactics can be seen by a few PAS members who are much more 'open', then, things went chaotic as they protested and questioned DAP's decision. Their question to DAP,"why not use PKR banners?" DAP has been fighting non-stop in rejecting all of PAS' principals, why use PAS banners? It seems that not all PAS members are blind. 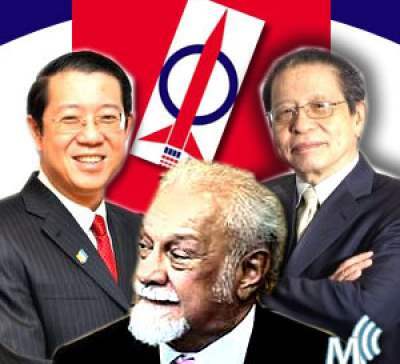 Despite of their openness, we still cannot understand why this group remain loyal to Pakatan Rakyat. If they do realize over the rejection on PAS' principals and aspirations, why still work alongside DAP? If PR wins, and DAP controls PAS and PKR, wouldn't it be because of their support? Don't they understand that supporting PAS automatically means that they are supporting DAP? Like it or not, that is the fact. Things get sadder for Malay Muslims is when the protest of this group does not gain full support as majority of PAS supporters are blind. The proof, a few pro-PAS websites and blogs are seen to be active in defending the usage of PAS banners by DAP. Actually, there are two issues here. First, DAP intentionally want to manipulate the minds of blind PAS supporters in the coming GE, second, DAP want rakyat to forget about their non-transparent actions in their CEC election process. Whatever it is, we are certain that rakyat will never forget what DAP is and how they are not transparent, not to mention stupid, in counting votes. penat baca...tulis bm la blue bear.